Rye berries are something new for me. 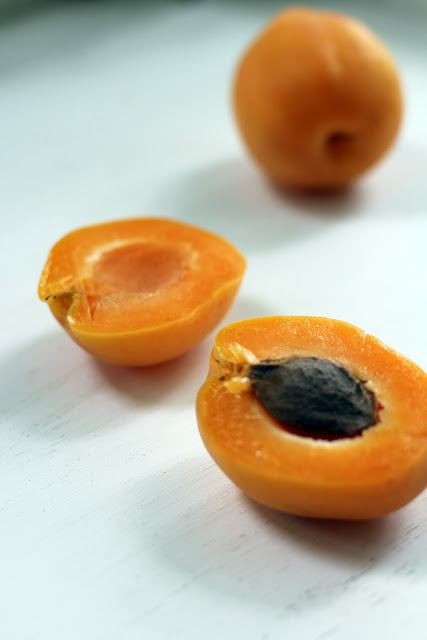 I recently discovered them through Bluebird Grain Farms, in Winthrop, WA. Last fall we bought a small cabin in Winthrop, and we now head over the mountains from Seattle to enjoy the Methow Valley whenever possible. Besides totally fulfilling my Little House on the Prairie dreams, spending time in Winthrop has exposed me to the Valley’s incredible food scene. 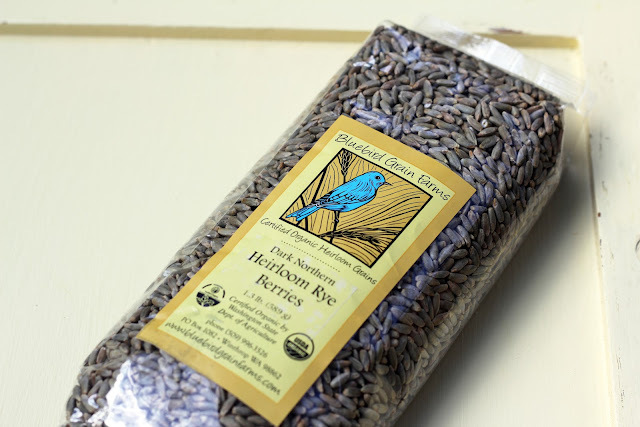 We are not far from the Bluebird Grain Farms, and their organic, heirloom grains are one of my happy finds. 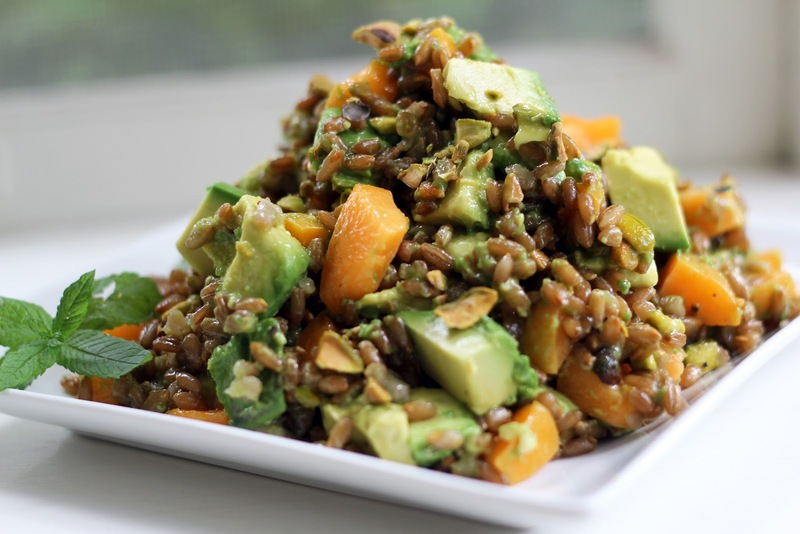 Given my love of whole grains, this is not a surprise! In particular, I appreciate the chewy texture and hearty, earthy flavor of rye berries. 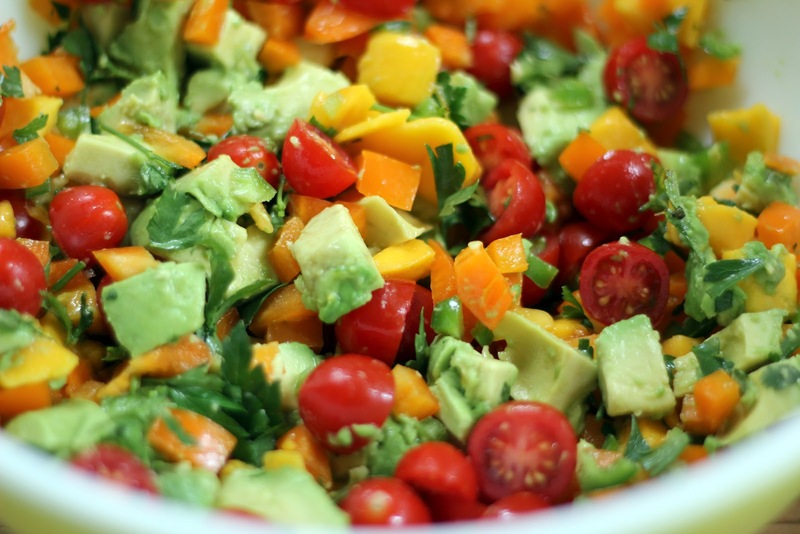 Creamy avocados and fresh apricots were sitting on the kitchen counter so I began chopping. From there, I added a bit of crunch with pistachios, a hint of sweetness from maple syrup and some mint and lime to brighten the salad up. 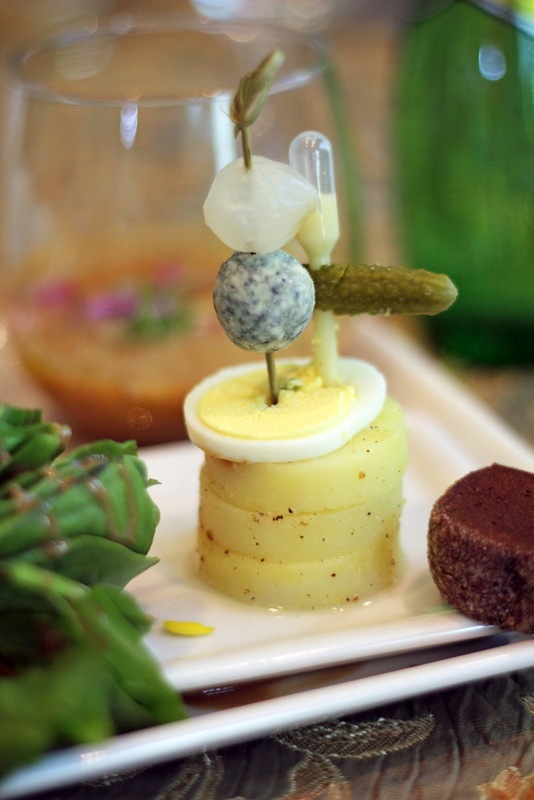 These flavors and textures are truly delightful together. 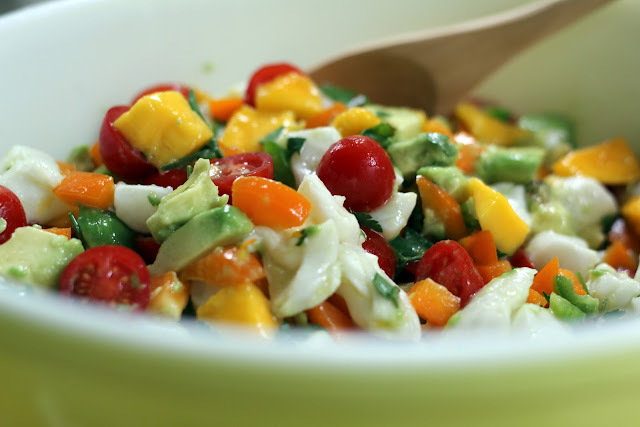 The salad makes a lovely light lunch or side dish for a barbecue. 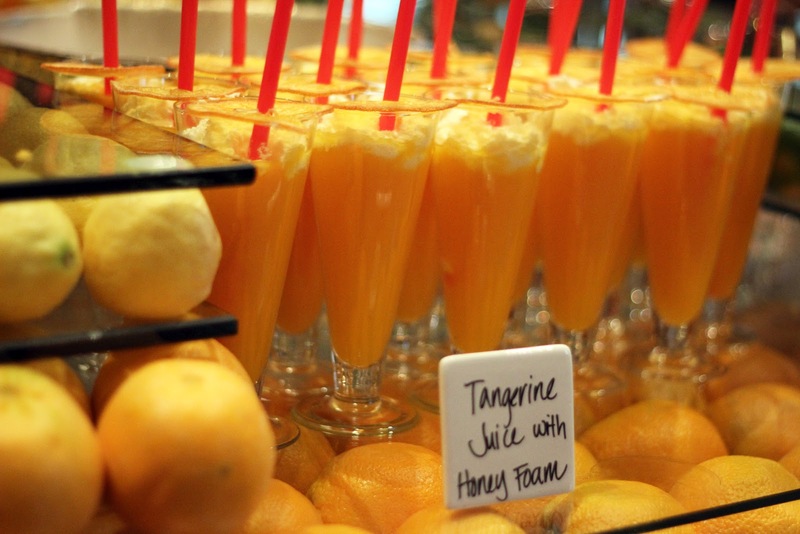 You could even add a dollop of yogurt for breakfast! 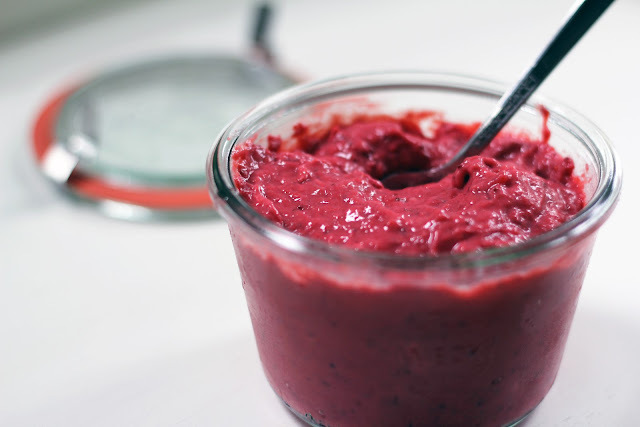 Combine the rye berries, water and 1 teaspoon kosher salt in a medium sized sauce pan. Bring to a boil, cover and lower heat. Simmer for about 25 minutes, until rye berries are soft. Drain any remaining water and set aside to cool (can be made ahead). Whisk together the syrup, olive oil, lime juice and remaining 1 teaspoon of salt. Spoon the rye berries into a serving bowl. 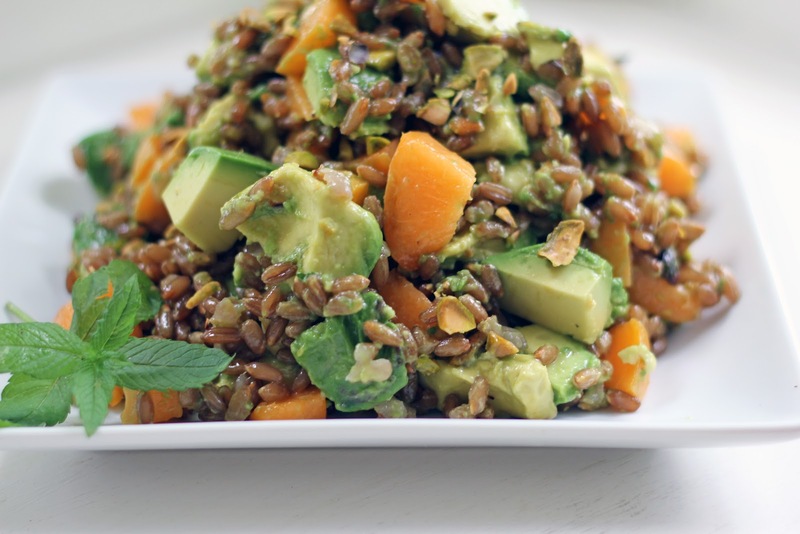 Add the avocados, apricots, mint and pistachios. Drizzle the dressing over and toss gently. Serve immediately. More strawberry delight! 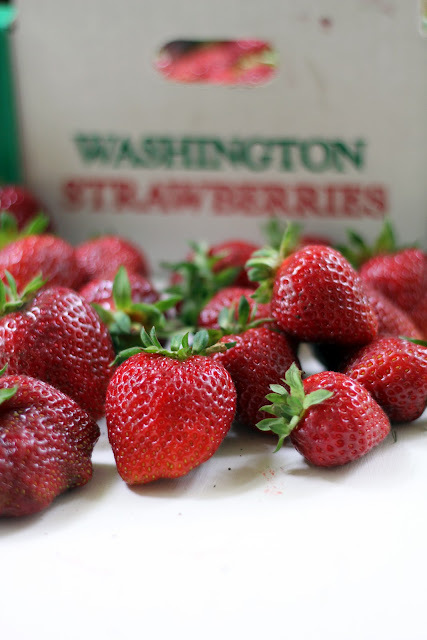 I cannot get enough of our local strawberries, and with our almost daily treks to the berry stand I am dreaming up different ways to enjoy them. Over the winter, when citrus was in abundance, I made grapefruit curd and it became a breakfast treat for us. With the summer and its profusion of berries, I decided to try adapting my grapefruit curd to strawberries. 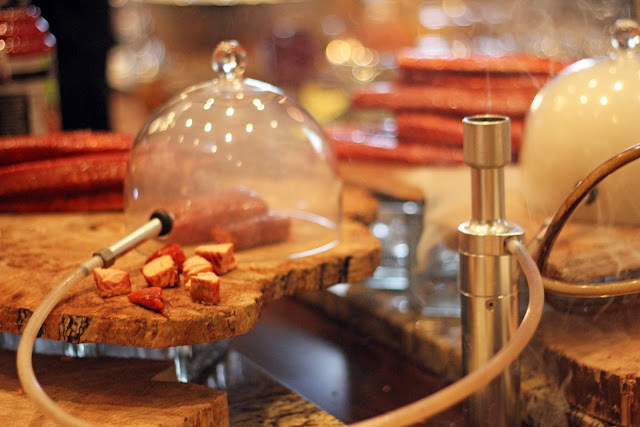 It is fun to experiment, and even more fun when the results taste good! Any creation using strawberries is going to be pretty. 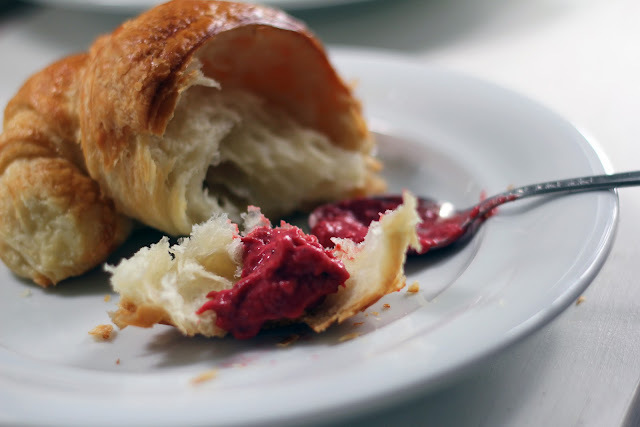 The appealing pink of this curd adds a rosy pop of color, especially to a flaky croissant. 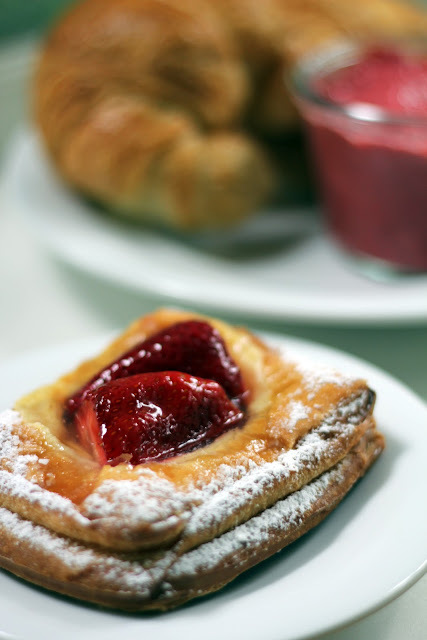 When I was picking out some pastries, I could not resist this strawberry croissant – pure decadence to top it with a dollop of strawberry curd! 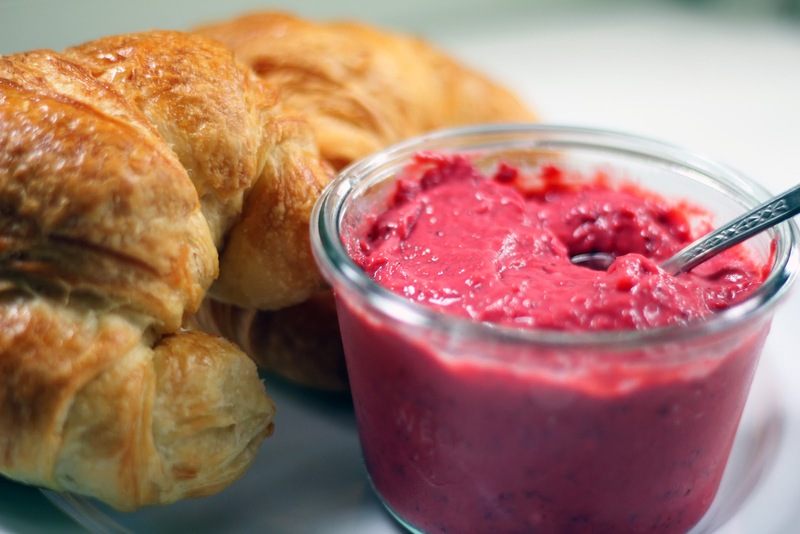 Strawberry curd is a delightful change from citrus curds. Its creamy texture is buttery and fruity and sings of summer. With blackberries and blueberries still to come, I think I see more experiments - and hopefully more curds gracing our table! In a medium sized saucepan, stir and mash the strawberries over medium heat until they break down and become saucy, about 10 minutes. Add the remaining ingredients and continue to stir until the butter has melted and the curd thickens and coats the back of a wooden spoon, about 5-10 minutes. Watch to be sure the mixture does not become too hot and curdle. If needed, turn the heat down to medium-low. 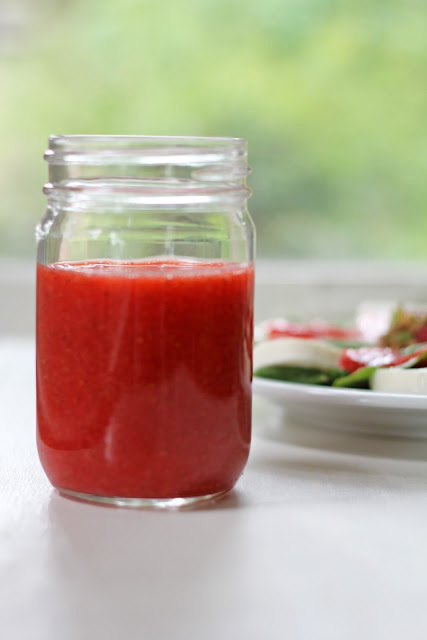 Remove the saucepan from the heat and pour curd into a jar. Let cool, then cover and chill. It will keep in the fridge for a few weeks. The first full day of summer is here and it is a glorious feeling. 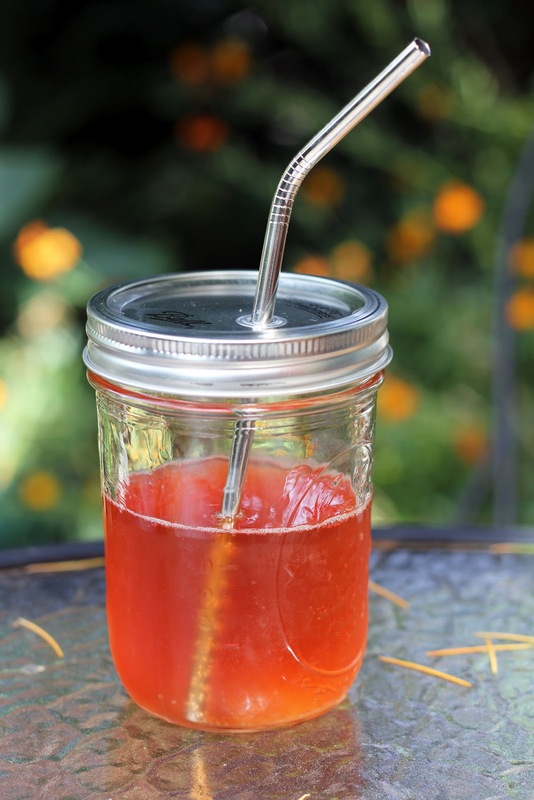 My sons will be out of school tomorrow, so then it will really feel like summer...but right now the sun is shining, it’s actually warm and I’ve been outside drinking kombucha from my adorable new summer sipper from the Book Larder (I can see a few portable gin and tonics in here, too ... ). With outdoor drinks and balmy evenings come the stirrings to have a barbecue. During the summer, we barbecue veggies, fish and meat. My husband and sons enjoy eating chicken, beef, lamb, turkey and duck, but I tend to ebb and flow in my desire for it. 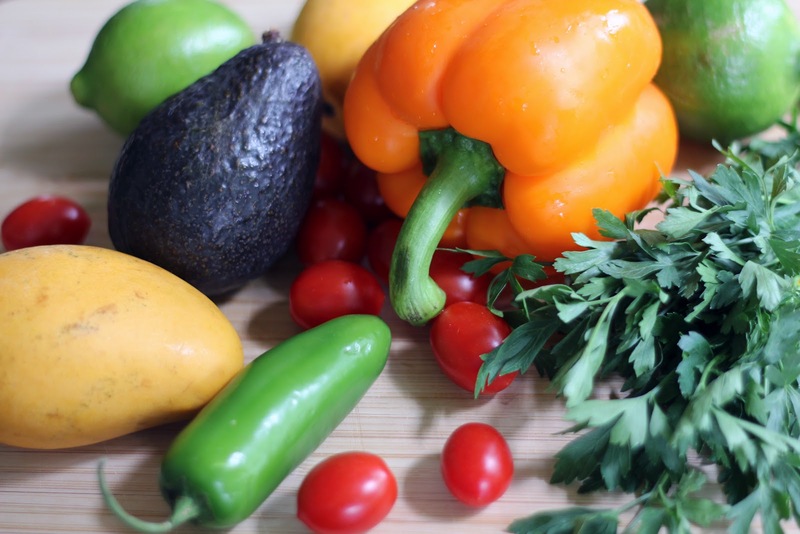 Over the years, I have found myself going through periods where I don’t eat any poultry or meat – my body just doesn’t want it, so I listen. After some time, though, I have a taste for it again and I’m not sure whether this is due to the seasons or something else but, again, I listen. 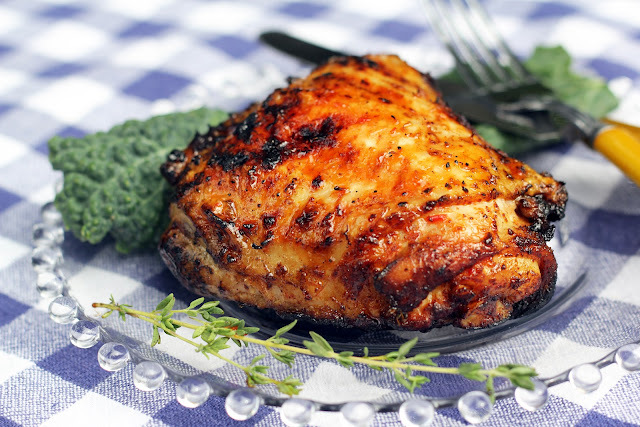 This is the first time I’m sharing a recipe for chicken on Blue Kale Road and I thought grilling season would be an ideal time to introduce our favorite barbecued chicken. This recipe is from our dear friend, Roz. She made it for us a number of years ago and since then it has become a summer staple and is consistently a hit. First of all, I love recipes where you can marinate the chicken ahead of time and then just toss it on the grill. 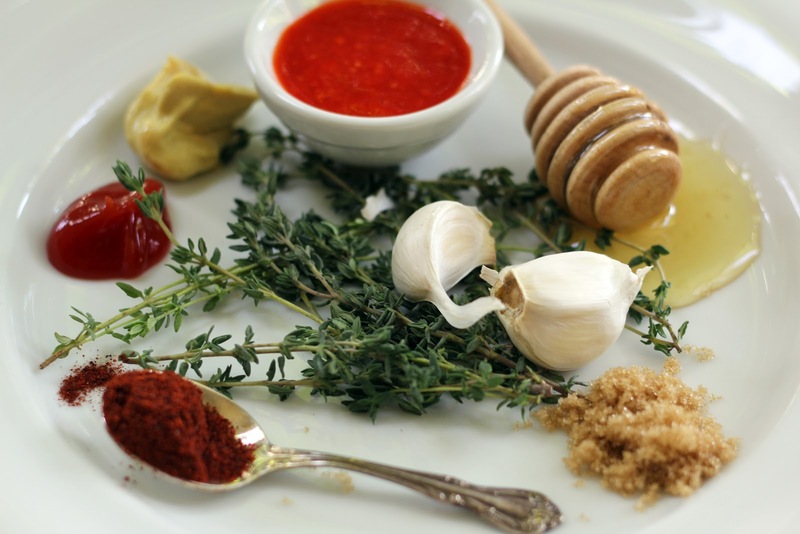 This marinade is full of flavor from chili powder, smoked paprika, garlic, thyme and brown sugar. When the chicken hits the barbecue, a glaze of honey, soy sauce, mustard, Worcestershire sauce, ketchup and sriracha is brushed on. 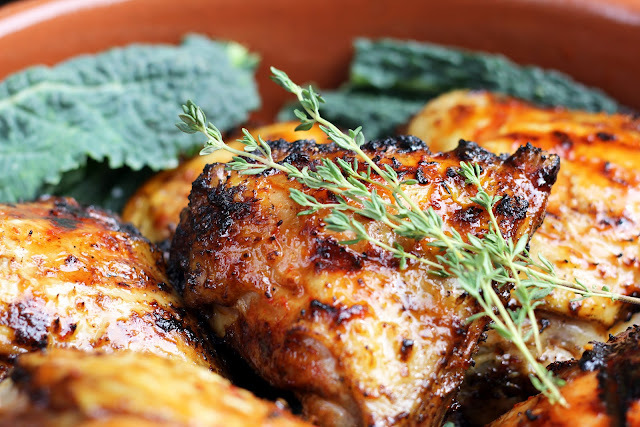 Sticky, sweet, smoky and spicy – your taste buds will be dancing! 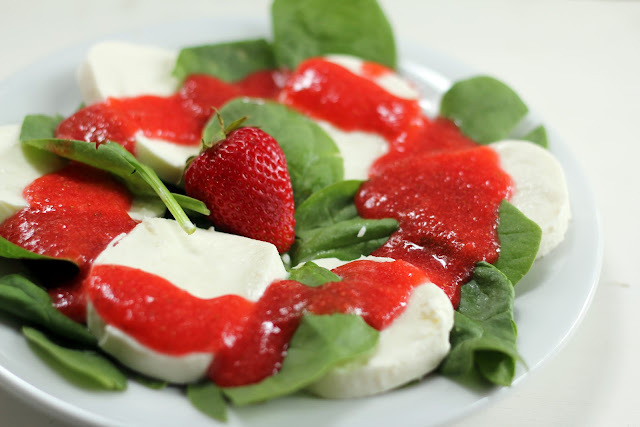 This one is a crowd pleaser and would make a terrific addition to a July 4th celebration. Happy Summer to you! Stir the marinade ingredients together and rub all over the chicken. Place the chicken in a large bowl and cover. Refrigerate overnight. Remove the chicken from the fridge an hour before grilling and let it sit at room temperature. When ready to barbecue, mix the glaze ingredients together in a small bowl. We have a gas barbecue and I turn it on high to preheat, then turn the heat to medium-low (the temperature should be about 350 degrees). Dip a scrunched up paper towel in some oil and, using tongs, rub the cooking grates to oil them. Place the chicken, skin side down, on the grates, brush some glaze on, close the barbecue and cook for about 20 minutes. Brush some glaze on again, flip the chicken pieces and brush glaze on the other side. Close and cook for about another 20 minutes, or until a meat thermometer registers 165 degrees inside the chicken. Brush some more glaze on, and turn over once more for a few minutes. You can turn the heat up a little to crisp the skin a bit if desired. Serve warm or room temperature. I am a pie person. I like cake, but I love pie. With summer approaching, it means pie and lots of it. 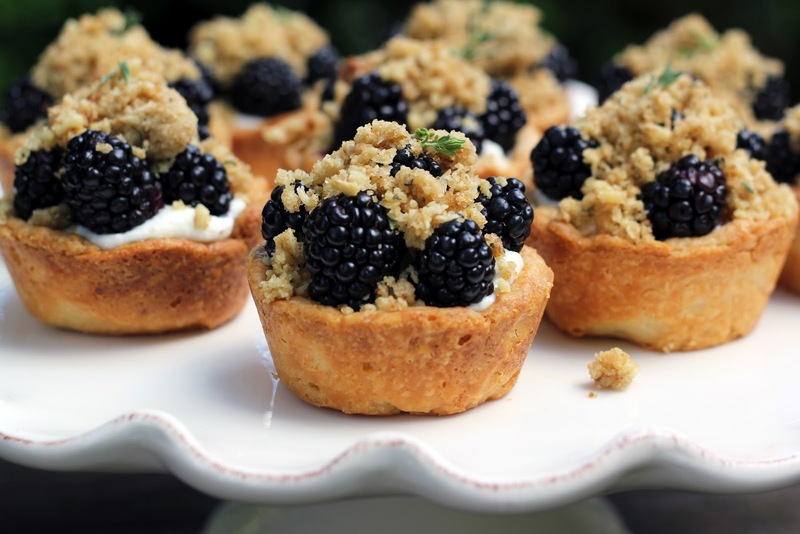 This month, Abby Dodge graciously gives us Very Berry Mini Pies for the Bake Together challenge. Thank you, Abby! I quickly began dreaming about what kind of little pies to bake and what flavors to combine. 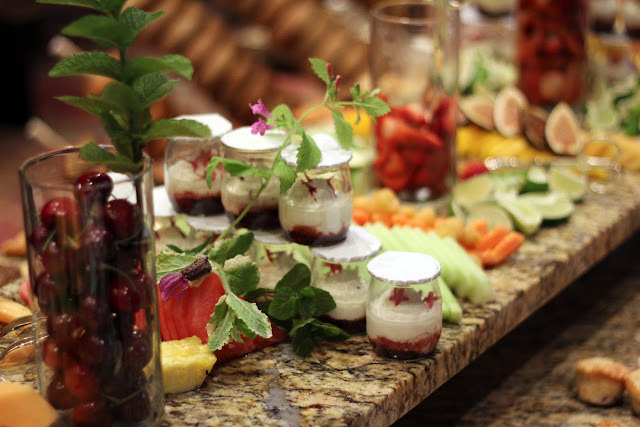 Occasionally, I add fresh herbs such as basil or marjoram to stone fruit and berry desserts, herbs that more typically go into savory dishes. I don’t care for pies that are overly sugared – I want to taste the fruit. The fresh herbs enhance the flavors of the fruit, and balance out its sweetness nicely. 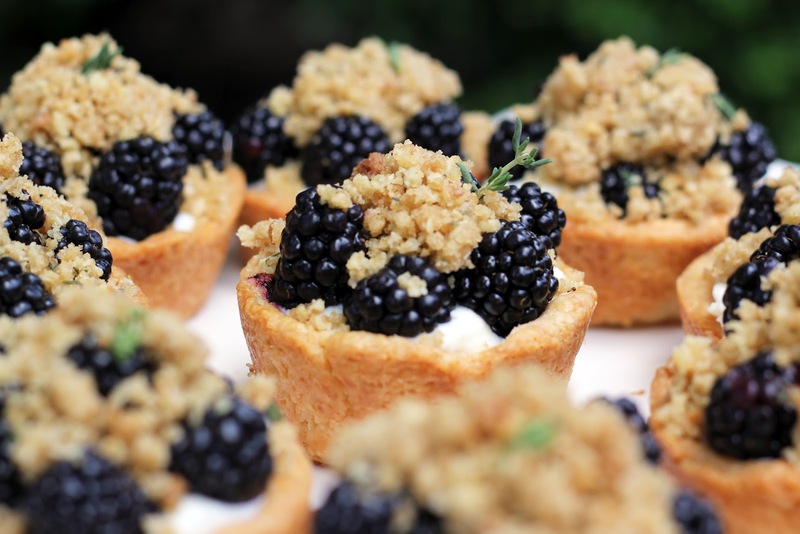 For the mini pies, I chose to include thyme in the streusel since I thought it a natural pairing with the blackberries I had just picked up. 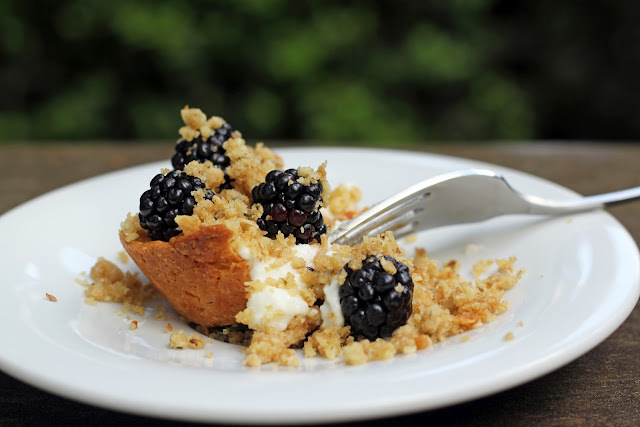 When I decided to use the blackberries fresh rather than baking them, I knew I needed a filling to anchor them on. Soft cheeses always appeal to me, so I stirred together goat cheese, mascarpone and ricotta with some honey for a creamy, rich, not-too-sweet filling. I have also been curious about using coconut oil in place of vegetable shortening. I was delighted to find the combination of butter and chilled coconut oil yielded a flaky crust that easily shattered – this is a little pie to eat with a fork and not your hands! Just in time for summer pies, I had the pleasure of taking a pie making class last week with Shauna Ahern, where she shared her pie making skills and some helpful tips. I learned I have been rolling pie crust dough all wrong! She recommends thinking of your dough disc as a clock, and rolling it in 10 minute intervals clockwise around the disc. This produces a more uniformly even thickness and doesn’t overwork the dough. Brilliant! My past method of rolling back and forth, back and forth, and then turning the dough to do more of the same was overworking it and usually ended up quite uneven. Using this new technique, my pie dough was rolled out quickly and efficiently. We happily ate all ten of these Blackberry Mini Pies on Father’s Day. 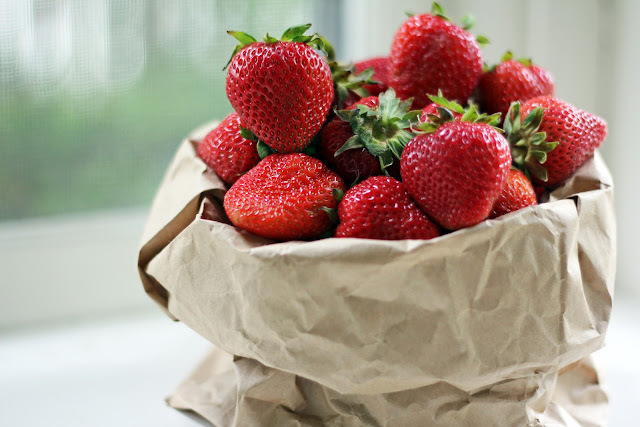 Due to the cheese filling and fresh berries, they should be eaten the same day they are made. Not a hard task with two teenagers diving in! Place the flour, sugar and salt in a food processor and pulse briefly to combine. Add the butter and coconut oil and pulse until the butter and coconut oil are slightly larger than pea size, about 10 to 12 pulses. Drizzle the water and lemon juice evenly over the flour mixture. Pulse until the dough begins to form moist crumbs that are just beginning to clump together, about 8 or 9 more pulses depending on your machine. Dump the moist crumbs onto a large piece of plastic wrap and gather into a pile. With the heel of you hand, push and gently smear the dough away from you until the crumbs come together (two or three ‘smears’ should do the trick – the coconut oil will be very soft so don’t overwork the dough). Shape into a 5-inch disc and wrap tightly in the plastic wrap and refrigerate until firm, about 2 hours, or up to 2 days. Remove the dough from the fridge and let it sit out until soft enough to roll, 10 to 20 minutes (depending on your kitchen temp and the weather). Arrange a large piece of plastic wrap or parchment on the work surface and put the dough in the center. Cover with another piece of plastic or parchment and press down on the dough to flatten. Using a rolling pin, roll the dough between the plastic or parchment to about 1/8- inch thickness. Roll at 10 minute intervals around the disc. Cut out 8 rounds using a 3 1/2-inch round cookie cutter or glass. Gather up the scraps, reroll to a 1/8-inch thickness, and cut another round. Reroll and cut one more round for a total of 10 rounds of dough. 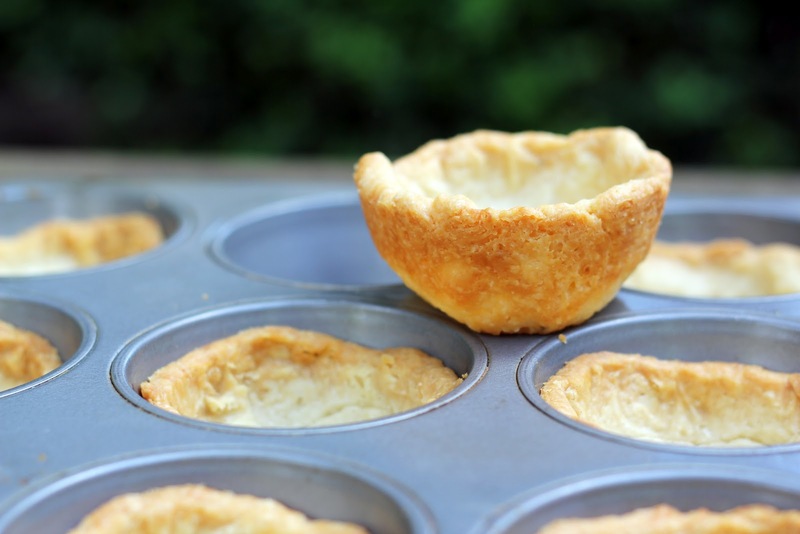 Lightly butter ten regular-sized (2 3/4- 3 inch diameter) muffin cups in a muffin tin. Working with one round at a time, use your fingers to gently press the dough into each muffin cup, making sure there are no air bubbles in the bottom and the dough is pressed firmly and evenly up the side to within 1/8 inch of the top of the cup. Repeat with the remaining dough rounds. Pop the muffin tins into the freezer while you make the streusel. 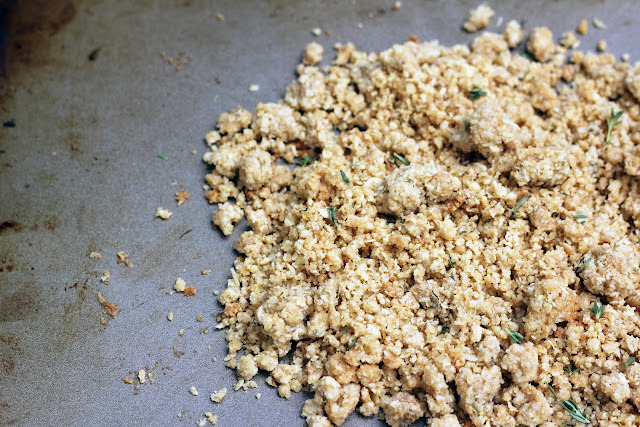 Put the flour, oats, brown sugar, salt, thyme leaves and walnuts in the bowl of a food processor. Pulse a few times, then add the butter. Pulse a few more times until it is in moist clumps. Spread evenly on a baking sheet and pop in the freezer for 5 minutes. Preheat the oven to 350 degrees. Bake the streusel for about 14 minutes, stirring after 7 minutes. When it is golden brown, remove from oven and set aside to cool. Increase the oven temperature to 375 degrees. Remove the muffin tin from the freezer. Cut 10 squares of foil and line each chilled crust with one, then fill with pie weights. Blind bake the crusts for 20 minutes, remove the foil and weights and bake for 5 more minutes, until golden brown. Remove from the oven and let cool. In a large mixing bowl, stir together the 3 cheeses with the honey, zest and salt until smooth. Remove the crusts from the muffin tin. Fill each mini pie crust with just under 1/4 cup of cheese filling. 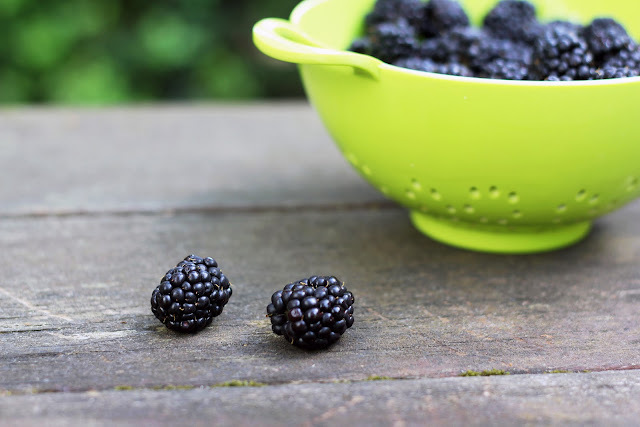 Arrange blackberries on each pie, 5-6 berries each depending upon the size of your berries. Sprinkle the streusel on top of each thickly. You will have some streusel leftover and it is delicious over ice cream or yogurt. Enjoy the pies right away, or within the same day. As Father’s Day approaches, I am remembering my father-in-law, Ron. I met my husband, Bob, when I was 20 and over the years Ron became like a second dad to me. I am truly fortunate to have two incredible men as fathers in my life. Ron passed away two years ago from ALS. When he was diagnosed, he never asked, “Why me?” but rather, “Why not me? I’ve lived a full life.” I can’t tell you how inspiring his positive attitude is to me. When life handed him ALS, he chose humor and dignity as his response. Ron lived life in the moment, appreciating every day what he could still do instead of what he could not. The more time passes, the more I appreciate how well he lived his life, with such grace, optimism and humor. He was kind, respectful, and took a deep interest in everyone he met. He always treated everyone with respect (to this day, Bob says he still can’t boo a rival sports team). Ron had a way about him that I often thought of as a quiet competence. He got things done, and you felt lucky to be a part of it. He showed his caring nature in many ways, sometimes unbeknownst to the recipient. 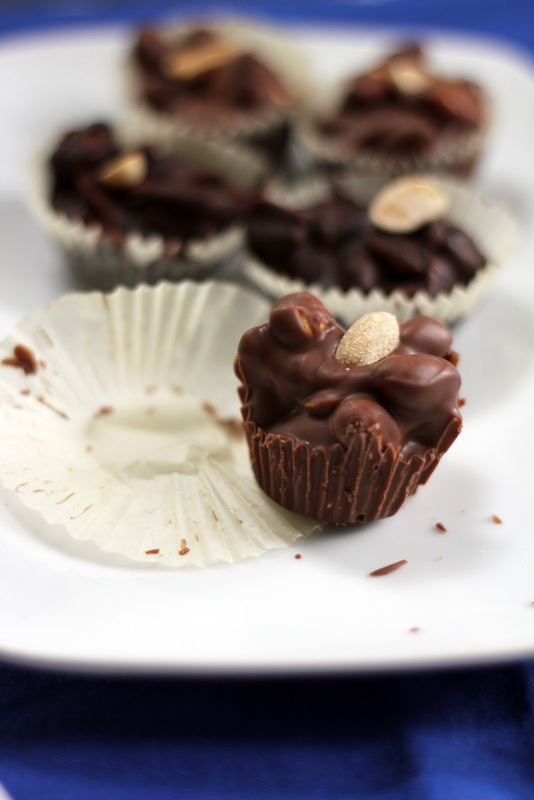 Ron’s favorite candy was peanut clusters, in particular the milk chocolate clusters from See’s Candies. I smile whenever I see See’s and think of Ron. Of course, I had to make some peanut clusters for Father’s Day. In addition to milk chocolate I also made some with dark. The different chocolates provided a nice contrast with each other – the smooth, creamy, almost caramel tasting milk chocolate against the bitter richness of the dark. I chose salted peanuts to get that glorious salty-sweet taste... heavenly. 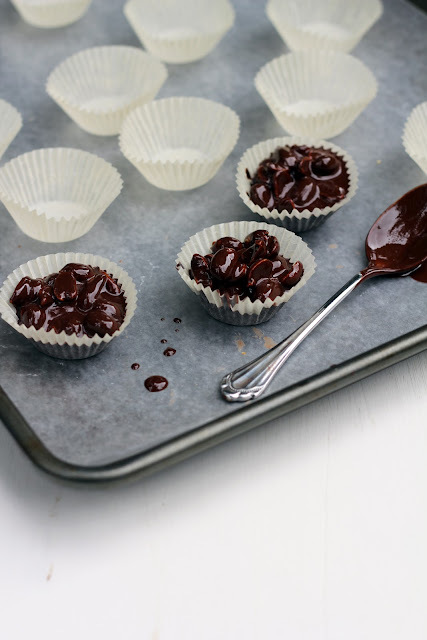 If you do not have a mini-muffin tin, you can just dollop the clusters directly into mini-muffin cups on a lined baking sheet. I look at my boys and it warms my heart to see them happily munching on their Grandpa’s favorite candy. Sam and Isaac are fine young men; they are open and loving, accepting and funny, and they appreciate all life gives them. I am proud to see Ron live on in them. I wish Ron was here to spend a little more time together. Line a mini-muffin tin with liners and line a baking sheet with wax paper. Set aside. In 2 small or medium sized saucepans, melt each chocolate separately over low heat. 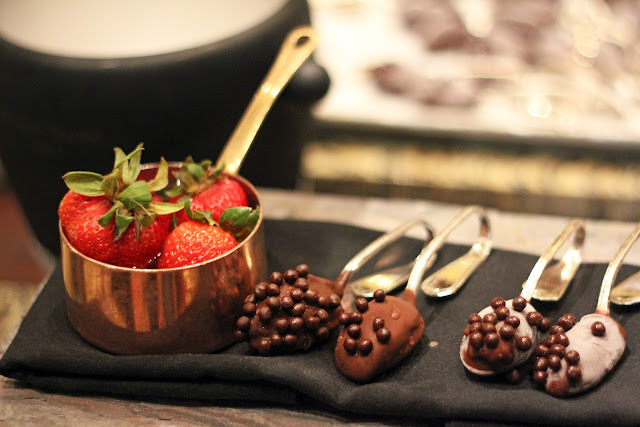 Stir often, and when most of the chocolate has melted remove pans from the heat and keep stirring until it is smooth. Set aside a small amount of peanuts to use as garnish. 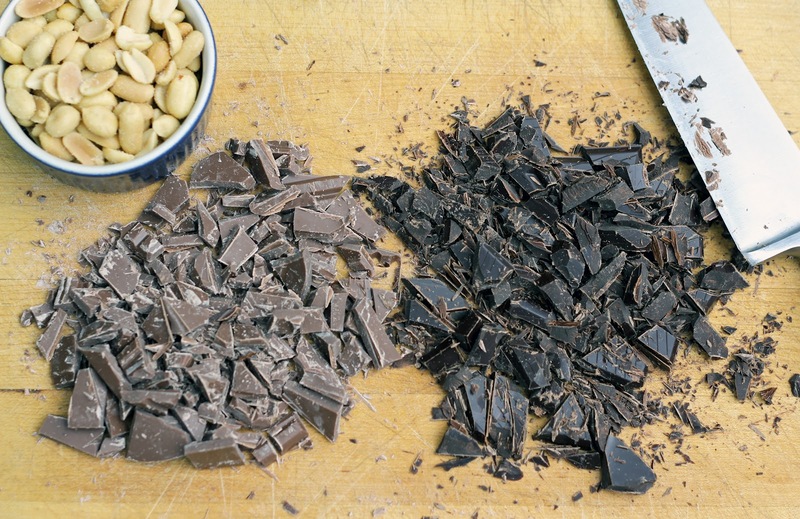 Divide the remaining peanuts in half and stir a portion into each of the pans of chocolate. 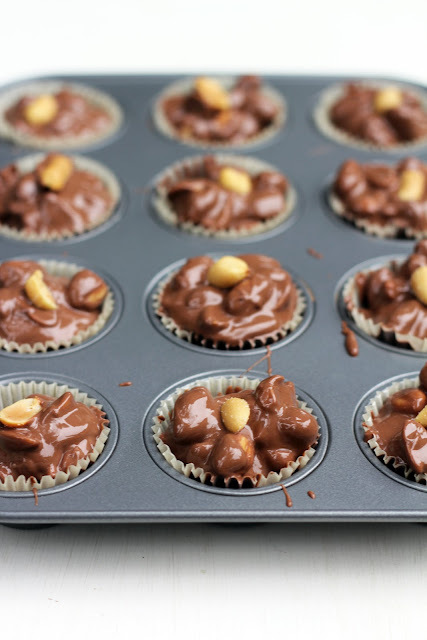 Using a teaspoon, dollop scoops of the chocolate peanut mixture into the mini cups, filling each one. 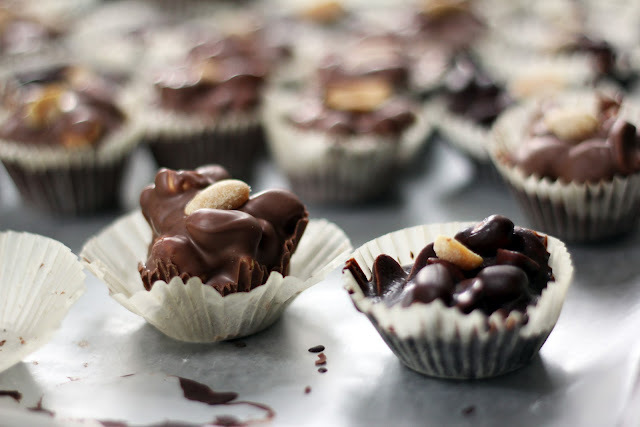 Drop a peanut on top of each chocolate to garnish. Let the chocolates sit at room temperature for a few hours until they firm up. They can be made ahead and stored in covered tin for a couple of weeks, but they won’t last that long. Summer is just around the corner - time for slowing down a little, barbecues and impromptu cocktails with the neighbors. I am filled with anticipation at this time of year! The kids’ school is in the home stretch, our neighborhood berry stand sets up, the pool opens and summer plans begin to form. It is a happy time indeed! Ceviche evokes summer for me. 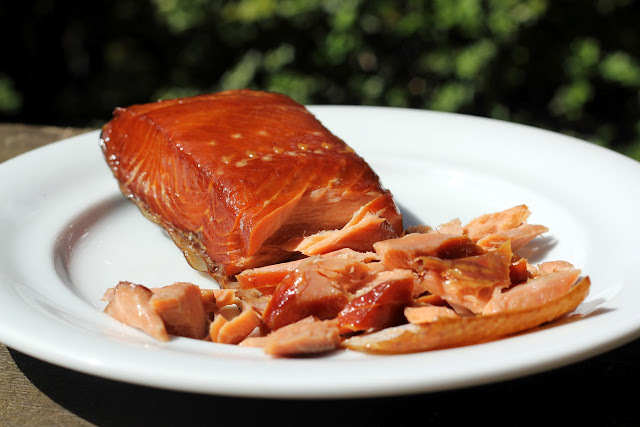 It makes an ideal meal for a stifling hot evening when you don’t want to turn on the oven, and is perfect for nibbling on while chatting in the backyard on a lazy afternoon, gin and tonic or cold beer in hand. I first made this version with mango and halibut last summer, just before saying farewell to our Saudi exchange student, Mohammad, who lived with us all year. He had never eaten ceviche before so we enjoyed it as a light lunch. Ceviche is quick to prepare. 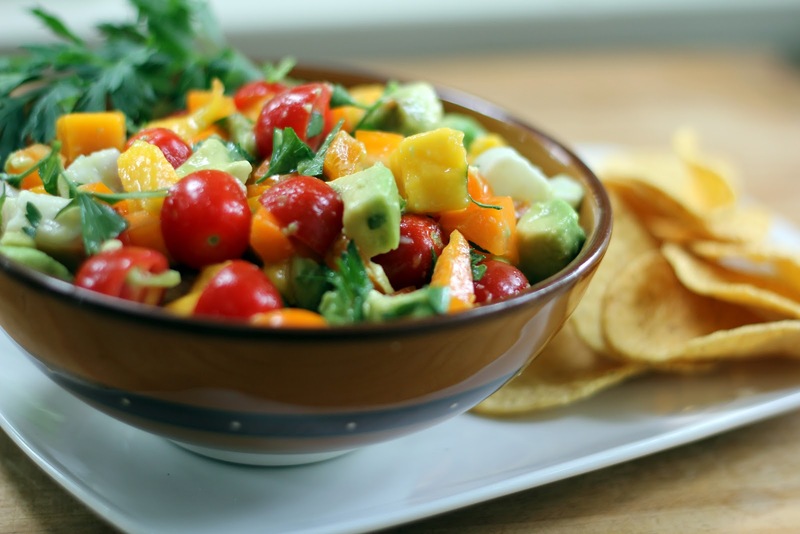 While the fish “cooks” in lime juice, you chop up mangoes, cherry tomatoes, parsley, avocadoes, jalapeno peppers and bell peppers to mix in. I love the vibrant colors and crisp and creamy textures. 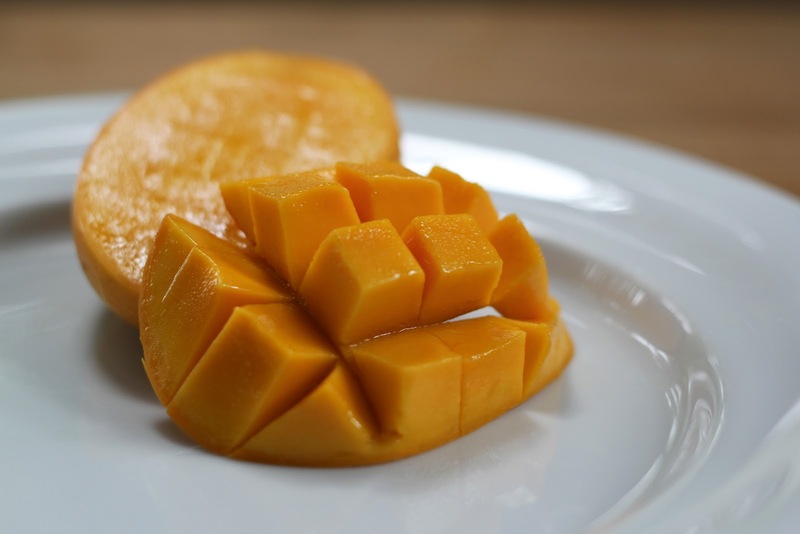 The heat of chili peppers combines with sweet mango and sour lime – makes your taste buds tingle! Now, if the sun would just return to Seattle we’d really believe summer is on its way. 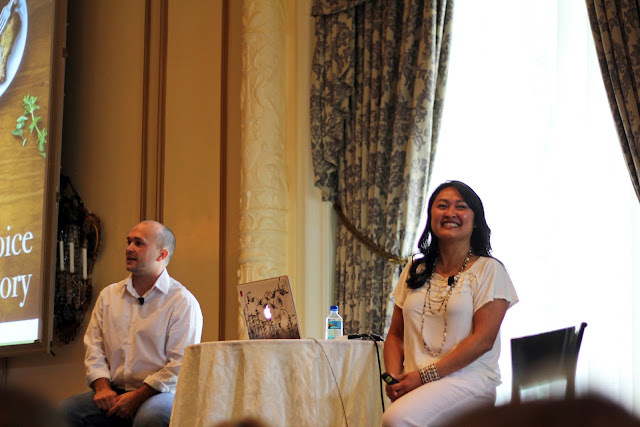 In the meantime, I am very excited to be attending the BlogHer Food ’12 conference here in Seattle tomorrow! I can’t wait to share with you about it next week. And I’m happy to say I’ll sneak in some warm weather this weekend with a quick visit to Santa Barbara for my brother-in-law’s birthday celebration...I’ll try to bring some sunshine home with me! Combine the halibut and lime juice in a medium sized bowl and stir gently. Chill for half an hour to allow the lime juice to "cook" the fish. Add the rest of the ingredients (except the tortilla chips) and stir gently. Taste for salt. Spoon into a serving bowl and serve with tortilla chips and an icy beer. I’ve decided ... brunch is the best. To wake up late, enjoy a selection of sweet and savory, sip hot coffee, chat around the table and lazily ease into the afternoon is pure happiness. 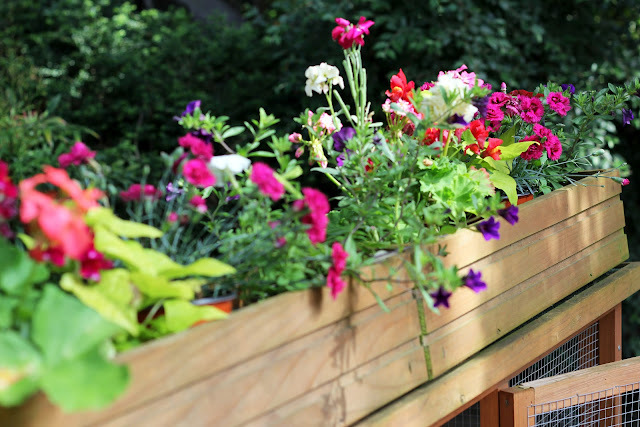 A sunny patio or warm breeze adds to the bliss, but is by no means necessary. Brunch is about good food and good conversation. 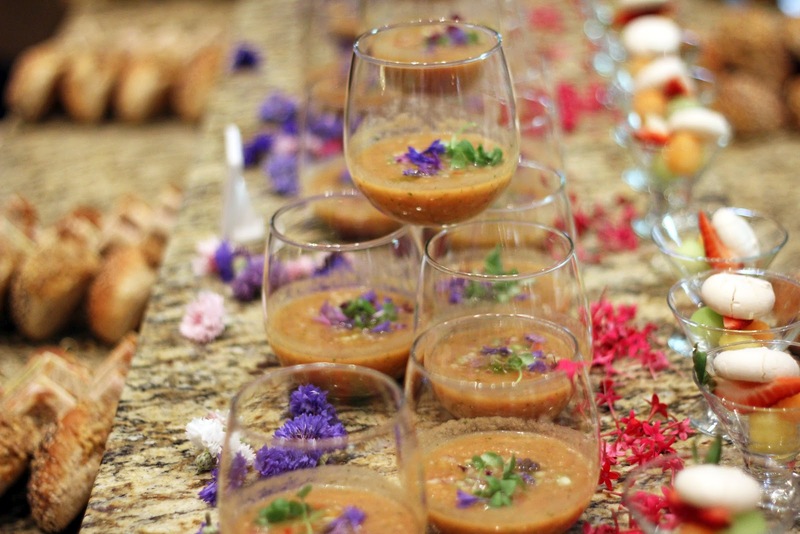 When I decided to host a brunch, I knew one of Katherine’s new recipes had to be on the menu. It was a difficult decision - I can’t wait to make all of them! 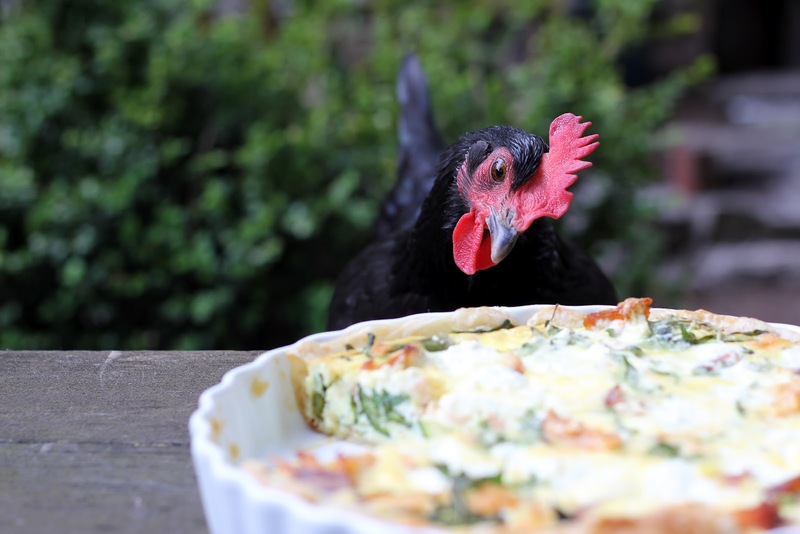 - and I settled on the quiche. 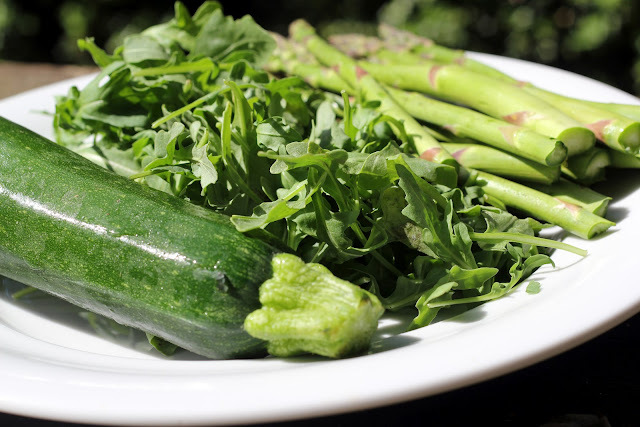 I was drawn to Katherine’s combination of arugula, asparagus, zucchini and ricotta. The original recipe also includes bacon, so I substituted an equal amount of smoked salmon. 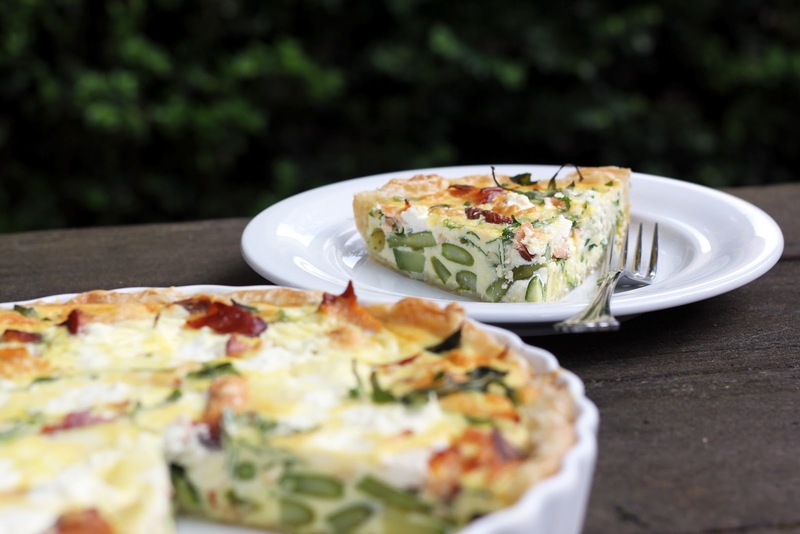 This is a quite a quiche! 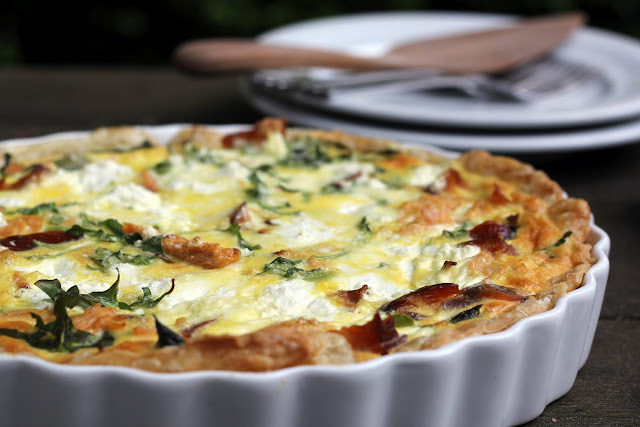 After the first bite, one of our brunch guests declared it the best quiche she has eaten and immediately asked for the recipe – it’s that good. The ingredients combined beautifully with a peppery kick from arugula, creaminess of ricotta, the fresh textures of asparagus and zucchini and a little saltiness from salmon. Since I didn’t use bacon, I sautéed the zucchini in a drizzle of olive oil (rather than in bacon fat) and it worked quite well. The puff pastry crust was a dream and baked up rich, flaky and buttery. Suffice it to say, I will always keep a stash of pastry in my freezer now. Thanks for the inspiration, Katherine! but I snatched the cooling quiche away from the picnic table before Eleanor could sneak a nibble! Preheat the oven to 350 degrees F. Generously grease an 11-inch tart pan with butter or baking spray. Roll out the puff pastry to a large circle about 1/8 inch thick. Evenly center it in the greased tart pan, press down and trim edges. Prick all over with a fork and weigh down with pastry weights or another ovenproof pan. Bake until light golden brown, about 10 minutes. Remove from the oven and set aside. Meanwhile, pour a drizzle of olive oil in a large skillet and add the zucchini. Cook over medium-low heat until tender, about 5 minutes. Set aside. Bring a pot of water to a boil and add the asparagus. Cook for 1 to 2 minutes until slightly tender, but not soft. 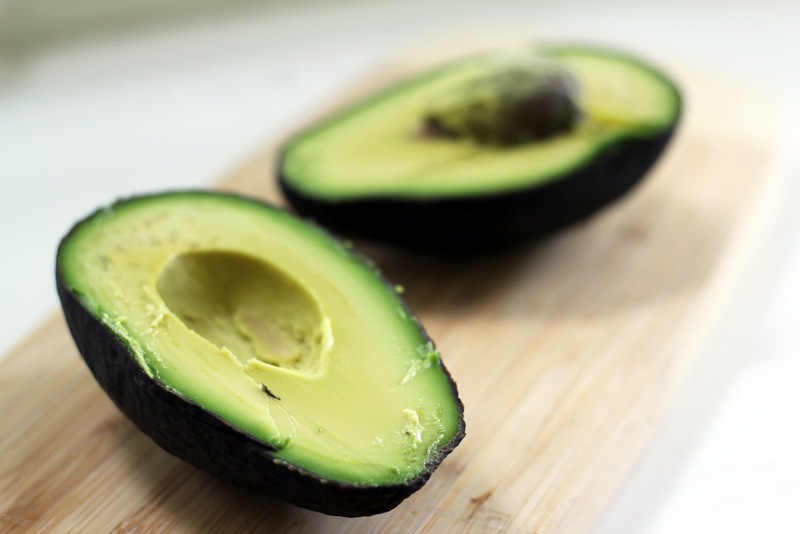 Drain and immediately run under cold water (this will stop it from cooking and help it keep its vibrant green color). Slice into bite-sized pieces. In a large bowl, whisk together the eggs and milk. Fold in the zucchini, asparagus, smoked salmon, arugula and 4 ounces of the ricotta. Pour the mixture into the pre-baked crust. Crumble the remaining ricotta on top. Bake until the eggs are fully set, 20 to 30 minutes. Remove from the oven and allow to rest at least 5 minutes before slicing.